I love to have healthy snacks around the house for my boys so this means I bake almost every day. I discovered this recipe on the Top 100 Paleo Recipes. It is orignially from the Paleo Parents blog and when you taste them and have eaten ‘paleo’ for a while you will discover these definitely taste like a treat. 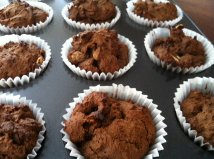 They are super moist and bursting with chocolate flavour (I’ve only made them with the cocoa option). I have once again used another blogger’s recipe and encourage you to check out these sites as they have plenty of great recipes and ideas to feed your families healthy food. (We used coconut oil or butter to replace the palm shortening in this recipe).